A summer issue of the Journal published by the Academy one of us belongs to had an interesting article on a new type of gluten-free pasta. The article title is: Green Banana Pasta: An Alternative for Gluten-Free Diets. Journal of the Academy of Nutrition and Dietetics – July 2012 (Vol. 112, Issue 7, Pages 1068-1072, DOI: 10.1016/j.jand.2012.04.002). The gluten-free flour pasta product is made from green banana flour, egg whites, water, and edible food source gum. Some people actually found the gluten-free pasta product more acceptable than pasta made from whole wheat flour. 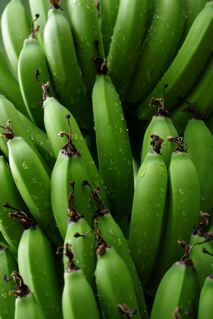 (Image of Green Bananas courtesy of johnnyberg at rgbstock.com). As a matter of fact, some people felt there was no significant difference in either the appearance, aroma, flavor or overall quality of the green banana flour based pasta product as compared to the whole wheat pasta. Inclusion of egg whites and edible gum in the green banana flour based pasta product actually promoted elasticity, firmness, moisture content, and uniformity in the green banana flour based pasta, which made it less sticky than most typical gluten-free pastas are. Interestingly, the green banana based pasta includes a high amount of what are called “resistant starches” (meaning they are resistant to digestion by humans). Resistant starches typically help to better control glycemic indexes of food items they are found in, and may have positive effects on intestinal actions such as reducing resorption of cholesterol in the gut, may decrease fermentation of starch in the gut by intestinal bacteria (which would result in less gas production in the gut), and might improve intestinal regularity of movement. Nov. 14, 2012 is World Diabetes Day and once again, the Diabetes Hands Foundation is promoting the Big Blue Test between October 14, 2012 -November 14, 2012. Exercise helps people with diabetes to lower elevated blood glucose levels. Persons with diabetes should learn about how much certain exercises of particular intensity & specific duration help them to better control their blood glucose levels. Lowering elevated blood glucose levels can help to lessen complications from diabetes in the lives of persons of all ages who are living with diabetes. Share the results to encourage others to exercise, too! This February 2013 accept the challenge of National Wear Red Day and wear red for women’s heart health! Make yourself a top priority in your own life. According to a couple of different sources–two women who have survived life threatening cardiac emergencies–Carolyn Thomas of My Heart Sisters blog site and Kathy Kastan (who has been a President of WomenHeart, The National Coalition for Women With Heart Disease in her book From the Heart: A Woman’s Guide to Living Well with Heart Disease, published in 2007, it is reported that nationally known cardiologist, Sharonne N. Hayes M.D., Founder of the Mayo Women’s Heart Clinic, tells women who attend the WomenHeart Science & Leadership Symposium for Women with Heart Disease about a study she is aware of addressing the priorities women have mentioned having as the latest millennium was dawning. Isn’t it time that maybe women started putting themselves first on that list? Can’t we possibly take better care of those we love if we take care of ourselves first and foremost? Check out Kathy Kastan’s book (one of us actually read it while recently on vacation) or Carolyn Thomas’ blog, then explore ways you can get involved in raising heart health awareness. Consider participating in this year’s American Heart Association National Wear Red Day and promote women’s heart health awareness among your family, friends and neighbors in your community and beyond. You can even sign up to spearhead support of National Wear Red Day at an area school, workplace, community center, etc. Do YOU Want to be the “Lady in Red”? (Go Red for Women) Take the First Step & Get Pinned! Hello Stephanie and thanks so much for including a link to my Heart Sisters article “Are You A Priority in Your Own Life?” here. Thanks especially for the advance plug for Heart Month and ‘wear red day’ in February. The results of the study you mentioned here are both fascinating and appalling. As I wrote in my article, whenever I do my women’s heart health presentations, I always ask the women in my audiences to guess the results of this study in the right order. Most women guess ‘children’ correctly right off the bat.’Once they guess that priority, invariably my audiences start calling out “Husbands?” next. There’s generally lots of high hilarity as I keep saying “no!” and we keep filling in the blanks in order – still no hubbies! – until after we get to ‘pets’. Yep, there they are – right under the dog . . . But when I ask my audiences: “What would you guess is last on this women’s priority list?”, it is always a very sobering and shocking revelation when “myself” is consistently the unanimous response. I like to let a few moments pass at that point to really let this disturbing reality set in. In our culture, women are socialized from early on to put everybody and everything ahead of our own needs. This has got to stop – particularly when it comes to our own health.